Bob Kramer Knives Review: Does Cramer By Zwilling Make The Cut? The difference between a cheap, mass-produced knife that you can buy at a department store and a high-end chef’s knife is astounding. You’ll find that your expensive knife is sharper, easier to maintain, and more fun to use. It will open up a whole world of cutting techniques that make previously painful prep much more bearable. In these Kramer by Zwilling reviews, we’ll examine the benefits of taking a further step up and purchasing an ultra-high-end knife made by a legendary German manufacturer to the specifications of a legendary American bladesmith. This classic chef's knife is made with easy-to-maintain stainless and is a perfect option for the home kitchen. For those who can afford it, this Kramer blade is one of the most beautiful and functional knives you can find. If you’re able to handle this incredibly sharp blade, you’ll find yourself in possession of one of the finest knives around. Before we get started, it’s worth differentiating handmade Bob Kramer knives and the more generic Kramer by Zwilling line. Kramer’s handmade knives have been consistently among the highest rated and most sought after blades in the culinary world. His reputation has earned him plenty of fame. 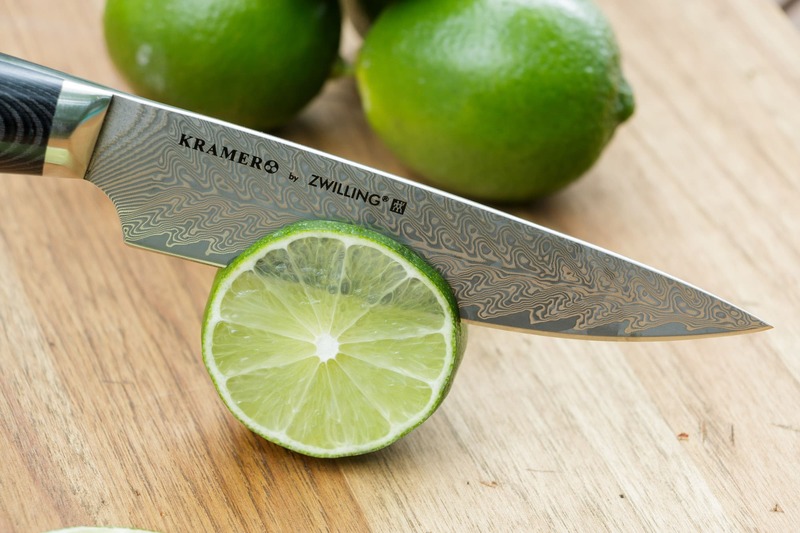 Zwilling, a fairly well-known manufacturer of high-end German chef’s knives, worked with him to create an imprint of knives known as Kramer by Zwilling. While these knives aren’t made by Kramer himself, they’re made to his exact specifications. Many chefs find these knives to be the best blend of quality and price around. While Kramer by Zwilling knives are somewhat expensive, they’re much cheaper than a “real” Kramer knife. Knives that are made by Bob Kramer himself are only sold at auction and frequently go for more than a hundred times the cost of a single Kramer by Zwilling knife. In 2015, a Kramer knife cost more than $30,000. For those of us who can’t drop more than the price of a new car on a single knife, Kramer by Zwilling is the best thing. 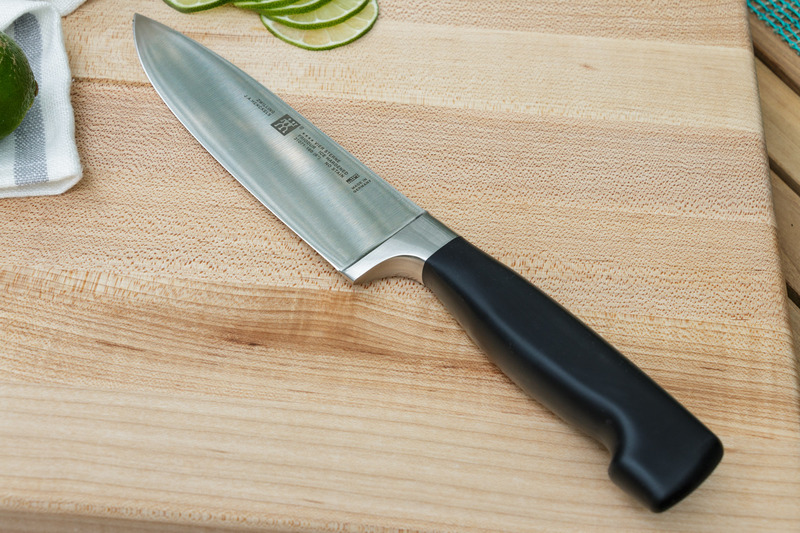 This classic 8″ chef’s knife is made with easy-to-maintain stainless and is a perfect option for the home kitchen. It’s priced quite fairly for the quality of the workmanship and the impressive branding. The most important detail of any knife is the blade material. This knife is made of FC61, a high-grade of stainless steel that’s often used in razors. 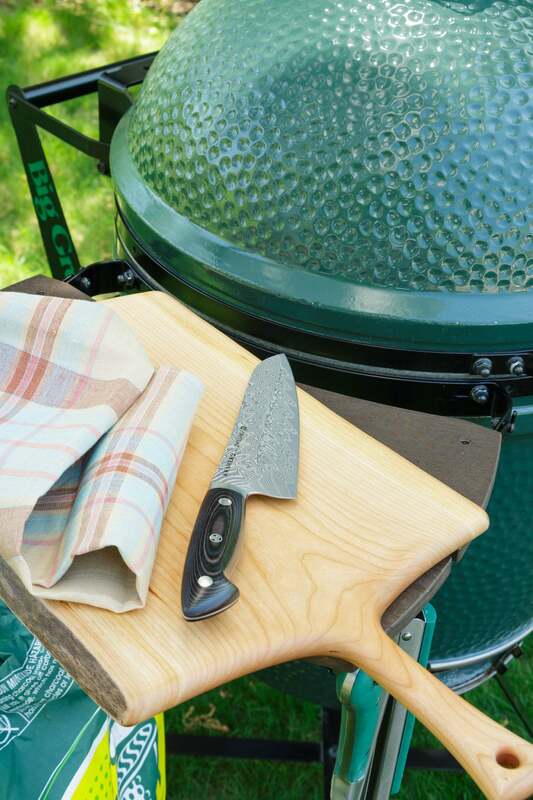 It’s incredibly easy to maintain compared to other Kramer by Zwilling options. If you’re not interested in carefully cultivating a patina, this is probably the Kramer knife for you. With knives in this price range, sharpness out-of-the-box isn’t really a factor. You’re probably going to polish it with your favorite set of stones or have a local knife shop reprofile it to your specifications the moment you open the box. Nevertheless, this knife is fairly sharp when it arrives. You’ll have no problems using it straight away to cut paper thin tomatoes or impress your guests by carving paper. The best part about FC61 steel is the hardness. It scores a 61 on the Rockwell C scale, making it quite good at holding a very sharp edge for a fairly long time. 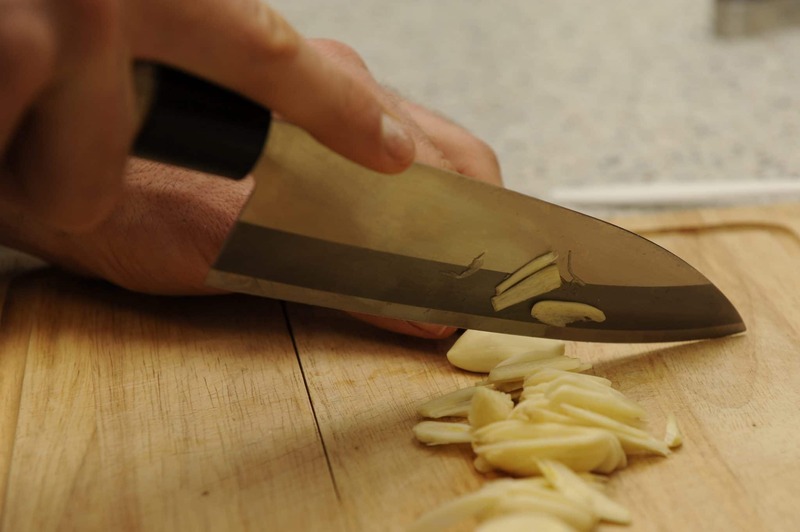 You can get away with honing this knife once a week in most home kitchens. Despite this, it’s still soft enough to sharpen yourself with most home sharpening setups. This makes it quite easy to maintain. This particular knife comes with a drab black composite handle. It’s not quite as nice or flashy as a polished wooden handle, but it does have the nice upside of being compatible with professional kitchens. If you’re getting this for work, this feature is a godsend. If you’re not, you might consider one of the flashier knives below. You do save some money by opting for a composite handle like this one, however, so if looks aren’t a big factor for you this knife might still be ideal. So how does this Kramer by Zwilling chef’s knife compare to other high-end knives? The short answer is that it’s a little bit nicer in lots of ways. The first (and most obvious) point is that the balance is superb. The balance point in this knife is perfect, allowing the knife to easily balance on your index finger as you cut. The result is a tool that you can maneuver around deftly and effortlessly. It’ll blow cheaper knives (like ones from Mercer Culinary) right out of the water as far as comfort and balance go. Another point is that the exact metal and hardness are a bit nicer than cheaper German-style chef knives, at least for some purposes. While the 61 HRC steel is ostensibly more brittle than a softer Zwilling or Henckels knife, it’s also easier to maintain. It’ll hold a sharper edge for much longer, making it ideal for delicate tasks that require a super sharp blade in kitchens where you can’t afford to spend lots of time honing your knife. One final point is that this knife isn’t actually that expensive. It’s pricier than a basic Victorinox, sure, but it’s cheaper than most Shun knives by a decent amount. If you want a quality, name-brand chef knife that won’t break the bank, this super premium Kramer knife is one of the cheapest options around. This knife is not perfect, however. The biggest issue is that some customers report inconsistent quality control with regards to the handle. 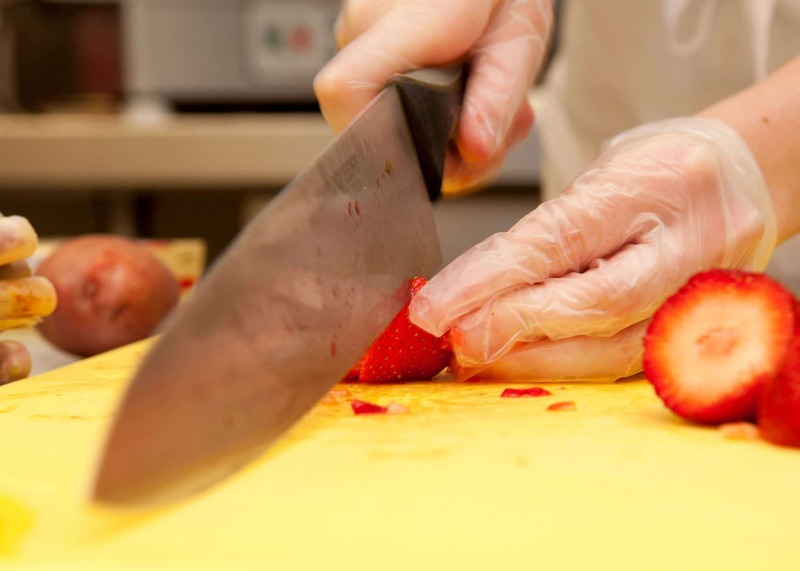 A minority of these knives have issues that involve the handle feeling loose or even separating fully from the knife. Zwilling is more than happy to issue new knives to those affected, but it’s a very frustrating issue to have with an expensive ultra-premium chef knife. I’m personally willing to overlook this problem in favor of this knife’s positive qualities, especially with how responsive Zwilling customer support tends to be. They work hard to uphold the brand’s stellar worldwide reputation. So should you buy this Bob Kramer chef knife? If you’re looking to upgrade a more basic, inexpensive chef knife and you want something that’s easy to maintain with flawless balance, the answer is probably yes. This knife is absolutely wonderful for professional chefs who want something with a composite handle and home cooks who want a knife that’s stain resistant and easy to sharpen. Most importantly, it’s priced quite reasonably, meaning it’s not too hard to fit into your budget. If you want something a bit more fancy, however, you’ll want to check out the options below. We’ll get back to knives that are affordable by laypeople in a second, but before that let’s have a bit of fun and dive into the world of fancy for a moment. In 2016, Bob Kramer sold a knife made of meteorite metal for over $31,000. This unique blade was created from a custom-made high-nickel, high-carbon steel and featured beautiful subtle patterns in the blade and a solid ebony handle. Why was it so expensive? The simple answer is that someone was willing to pay that much. Kramer auctions his blades off from his website. You can check out the link above to get updates about future auctions and maybe even bid in one yourself. Prices can get quite high, of course, and you don’t know when you’ll win a bid, so if you want a knife now you’ll probably want to simply buy a Kramer by Zwilling instead. While these knives are made from more “normal” metal (no meteorites involved), they’re still more than good enough to impress your friends. This SG2 knife features incredibly beautiful Damascus patterns all along the blade. It’s got a fancier fake wooden handle that’s smooth, comfortable, and much nicer looking than a plain composite one. While these features make it more desirable than the basic Kramer by Zwilling knife above, they also make it a fair bit pricier. First of all, let’s talk about the metal. SG2 is known as “super steel” due to its incredible properties. It’s a strong, durable metal that’s somewhat stain resistant and quite hard. This makes it amazing in cutlery since it can hold an edge well and doesn’t patina or stain. While you should definitely stick to hand-washing this beautiful knife, it’s not going to be as big of a challenge to maintain as a carbon steel knife. This knife isn’t the sharpest thing in the world right out of the box. Like other Kramer by Zwilling knives, this isn’t a dealbreaker. 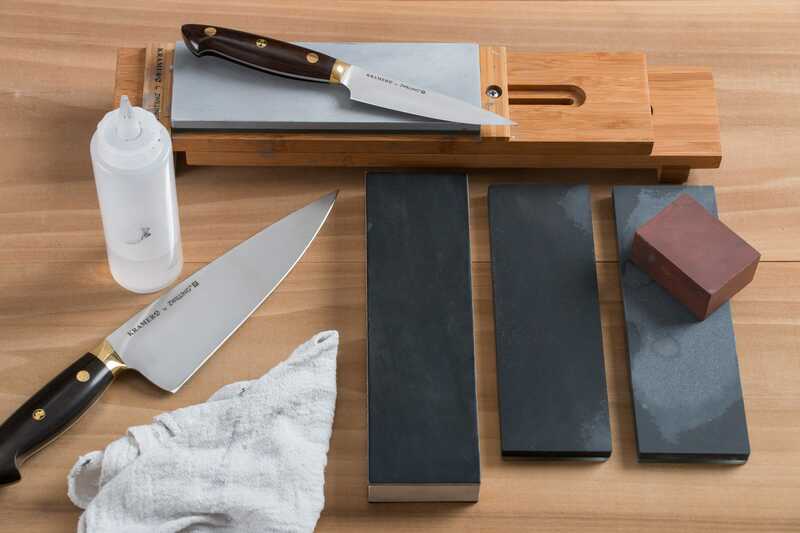 It’s still sharp enough to be used and even shown off, but it will get even sharper with a proper pass on a set of whetstones or a visit to your local knife shop. It’s more than worth it to spend a few extra bucks to get this knife properly sharpened when it arrives at your door. Aesthetics are definitely a big part of this knife’s appeal, and you’ll immediately realize why when you open up the decorative box and take a look. It features beautiful, bold Damascus ripples that are laid out in a sort of regular pattern that seems simultaneously engineered and organic. It’s definitely one of my favorite Damascus blades, period. It’s clear that both Zwilling and Bob Kramer know what they’re doing when it comes to making nice looking knives. The handle on this knife is similarly a cut above the composite option offered with the basic chef knife above. The dark micarta feels almost like wood on your hand and looks quite convincing. I’ve seen at least one professional chef be fooled into thinking the handle was real wood. This is nice for two reasons: one, micarta is cheaper, so you’re getting better steel and more vivid Damascus patterns for your money, and two, micarta can be used in some professional kitchens while wood cannot. The balance of this knife is superb, although, in my opinion, it’s slightly worse than the balance of the carbon steel Kramer by Zwilling chef knife below. The handle is a bit heavier, so the knife balances about where your first finger sits. For me, this is a mild downside, since I like it when my knife tips forward slightly in my hand. If you prefer your balance to be farther aft, however, this knife will be perfect for you. Given the absolutely incredible aesthetics, professional handle, and great balance, I wholeheartedly recommend this knife to anyone who doesn’t mind the price. It’s definitely expensive, however, so I definitely understand if you want to get the cheaper basic chef knife plus a paring knife or some whetstones instead. For those who can afford it, this Kramer by Zwilling blade is one of the most beautiful and functional knives you can find. If you go by the list price of this knife, you’ll probably assume it’s a mid-range option in between the expensive Damascus and the cheaper basic chef knife above. This isn’t quite true. In my opinion, this high-carbon blade is the real gem of the Kramer by Zwilling collection. 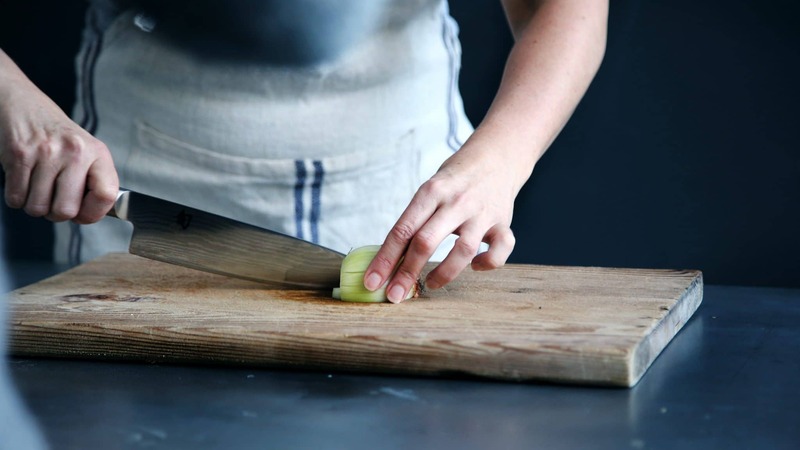 It’s an esoteric knife that’s most at home in the hands of an experienced cook who can care for it properly. If you’re able to handle it, however, you’ll find yourself in possession of one of the finest knives around. Why? The reason is simple: the metal. This knife is made from 52100 carbon steel, which is the same type of steel that Bob Kramer uses in many of his handmade knives. It’s incredibly good at holding very fine edges due to great apex stability and hardness., especially when it’s made with modern heat-treating techniques. This means that this knife is one of the market leaders as far as sharpness is concerned. It might not necessarily have a crazy grind right out of the box (although it’s quite sharp), but you can put a very, very fine angle on it without too much work and the knife will keep that edge for a long time. You’ll need to maintain the edge, of course, and it won’t last forever, but if you want a knife that you can literally shave with, this is one of your best bets. There is a big downside, however, when it comes to care and storage. This knife will rust, fast, especially at first. For the first month or so after you get this knife, you’ll have to carefully dry it IMMEDIATELY after you clean it or even cut wet foods. This includes things like tomatoes, onions, and other moist vegetables. You’ll probably want to oil it frequently. Even with careful diligence, you may find yourself scrubbing off a rust spot or two. After a month, your knife will start to look a bit old. This is because it’s developed what’s called a patina, a stained outer layer that serves as a natural barrier against corrosion and rust. It won’t keep your knife totally safe from all types of damage, of course, but it will mean that you can use it more-or-less normally. You’ll still want to keep it dry and maybe even wipe it off after cutting particularly succulent vegetables, but it won’t rust uncontrollably from the mere hint of water vapor. Now, some people find patinas unattractive. I am definitely not one of them. A patina isn’t quite as beautiful as a well-crafted Damascus pattern, sure, but it’s a unique set of not-unattractive stains and blemishes that adds a lot of character to your knife. Some authors compare it to a dog-eared book or a well-worn coat. A patina makes your knife seem sophisticated and distinguished, especially among knife connoisseurs. If you want to shorten this process, you can force a patina by exposing your knife to a mild acid. Some people simply cut a bunch of lemons, but the easiest way to do this is to soak a towel in warm vinegar and wrap your knife in it. The blade will darken and stain over time. Check back on the state of your knife every few minutes and remove the knife when the patina has set in. Experts suggest two to three hours of total soak time, but you’re free to vary this based on your own personal preferences. You can texture your patina by using a textured towel or even wrapping a vinegar-soaked string around your knife. If you wanted to get really fancy, you could even alternate two strings with different acids (vinegar and diluted vinegar would probably be best for beginners) to get patterns of different strength. 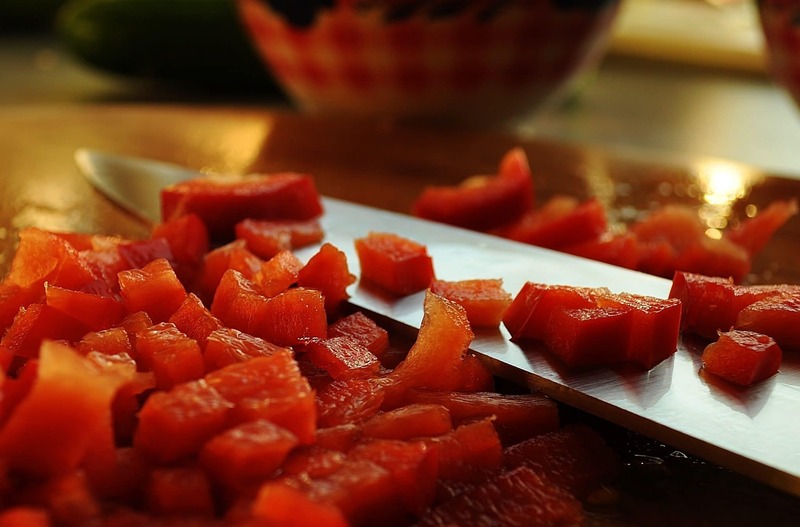 For a more uniform pattern, try soaking the knife in vinegar directly. Some people like to use different acids for their patinas. I find that vinegar is the most sensible: it’s weak enough that you won’t accidentally ruin your knife, but it’s strong enough that it gets things done in a reasonable amount of time. The biggest upside is that you can remove your patina with steel wool at any time if you decide you don’t like it or even re-apply your patina straight over your old one. With stronger acids, you don’t always have that option. Can you avoid putting a patina on your knife? Sure, with a lot of work. If you’re especially diligent in cleaning and oiling your knife you can keep it shiny and polished for pretty much forever. I mentioned a month above because that’s how long it took one of my friends to develop a patina “naturally” on theirs. Even if you accidentally let a bit of patina form on your blade, you can simply scrub it off. It might be easier to just get the stainless Kramer knife above, however, especially since that knife is more than hard enough to hold a pretty fine edge. The handle on this knife is made from African Blackwood. 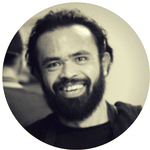 It’s very beautiful and has a subtle wooden texture that gives it quite a bit of character. The balance is incredible, with the balance point sitting more-or-less where the blade and handle meet. For me, this is absolutely perfect due to how easy it makes both rocking and chopping motions. Some chefs prefer the slightly more handle-balanced Damascus knife above, however. Like the other Kramer by Zwilling knives, the profile on this blade is near-perfect for virtually all styles of cutting. It’s got more than enough belly for rocking cutting styles, while plenty of flat blade near the bottom makes it just as good for chopping. 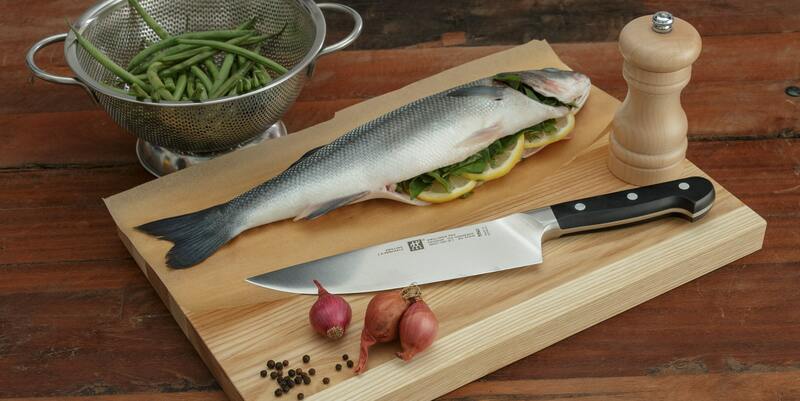 It’s a true hybrid knife that can be used by any chef in pretty much any kitchen. Yes. In addition to the difficulty of keeping this knife clean and rust free, this is actually a fairly light knife. If you’re used to the weight of your knife doing a lot of work as you cut it might take you some time to get used to this particular blade. That said, the incredible edge will more than make up for this: the weight of the knife is enough to cut most ingredients. For serious knife people, this is definitely one of the nicest blades you can buy. Maintenance is a pain, sure, but you’ll be rewarded with an incredible tool with one-of-a-kind looks that you can customize yourself. The edge retention is insane, and you’ll love doing food prep with whatever crazy grind you decide you want to put on this bad boy. While the aesthetics aren’t quite as clean as the Damascus knife above, the patina your knife develops (if you decide to give it one) will be totally unique, meaning nobody else will have a knife quite like yours. The incredible balance, great profiles, and overall solid design of Kramer by Zwilling make it one of the best lines of knives around. These high-quality blades have excellent edge retention and feel absolutely wonderful in your hand. Whether you want a sleek stainless knife, a dashing Damascus blade, or a unique high-carbon blade for the sharpest cutting action around, Kramer by Zwilling is a solid choice. Most importantly, these knives are fairly reasonably priced. While they’re a bit more expensive than brands like Dalstrong and even normal Zwilling knives, they’re just a little bit better in most of the ways that count, making them ideal for serious chefs and knife enthusiasts. 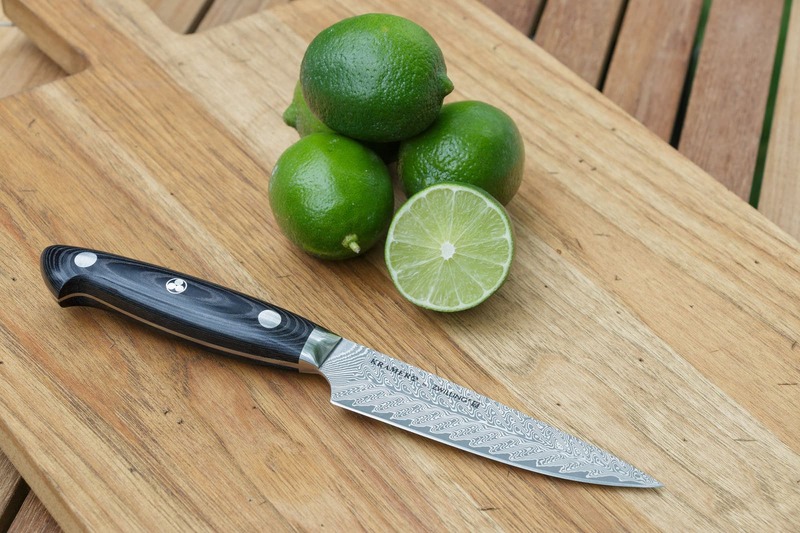 Santoku vs Chef Knife – What’s The DIfference?